Happy Tuesday everyone, we hope you all have enjoyed your weekend. We’re back this week with another dose of Taste Test Tuesday. This time we’re going sweet and salty! How many people love popcorn? Does it matter what flavor it is? For us it doesn’t, we eat a lot of popcorn in this house lol. While out shopping over the weekend, we spotted this popcorn and wondered if it really tastes like Kettle corn. We grabbed a bag and decided to check it out, little did we know we were in for a treat. One bag is not enough. Opening the bag you get a whiff of an aroma that reminds you of the county fair. Then you, take a bite of one kernel and you are hooked. I’m talking sweet and salty in every bite. I don’t know how they did it but this sweet & salty popcorn is definitely a treat. You can have it at anytime, we had to pause the movie and run back out to get some more, that’s just how good it is. Having a bag full reminds me of growing up in Massachusetts going to the Big E every September and spending my summers in South Carolina going to the farmer’s market. The memories of those times with family and friends keep me going when times are hard. 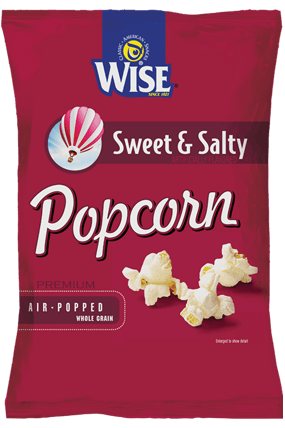 So Wise, we thank you for this Sweet & Salty Popcorn, its delicious!! Halloween: To give candy or not to give candy? Food News: Ecto Cooler is Coming Back! I think we will have to try some! Found you on Virginia Bloggers! !